Breakfast guests study their auction catalogues, getting ready to spend money in support of the Commons! Casey Smirniotopoulos, vice-chair of the Third Place Commons board of directors, served as emcee for the day. She shared thoughts on the “Commons Community Values” throughout the program. These core values include accessibility, community, inclusivity, connection and collaboration. She pointed out that inclusivity is built into our “open to everyone” vision for the space. Meanwhile, accessibility is fundamental to everything the Commons does – from offering over 900 free events each year, to hosting partner organizations on the Commons stage at no charge, to distributing Market Bucks food assistance vouchers to community members who struggle with food scarcity. Casey also noted that we focus on real-world, face-to-face interactions here at the Commons and at the Lake Forest Park Farmers Market, in order to achieve genuine human connection (rather than the digital kind). And collaboration is essential as we partner with others to host events, fund and distribute Market Bucks, and bring community members together to develop their own collaborations and partnerships. In fact, our mission statement actually articulates such partnerships as part of a three-pronged approached to fostering and enriching real community in real space. Those three prongs include hosting public events, presenting the Lake Forest Park Farmers Market, and partnering with others to help maximize their impact. Our board chair, Norman Lieberman, highlighted another of these core values – community – which he noted is not just a value, but the organization’s actual mission. 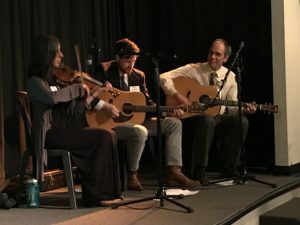 And he talked about all the ways that individuals come together to form community at the Commons through music, dancing, games, play, classes, meetings, shopping at the market, conversation, laughter and more. 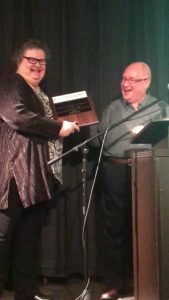 The highlight of the program was when Norman, who also serves as chair of the breakfast committee, presented the annual Friends of the Community Award to the Shoreline Area News Editor Diane Hettrick. Diane founded the online publication with her partner 2009 as a new, daily source of community news – by the people and for the people. For nine extraordinary years, Diane has run the Shoreline Area News solely out of the goodness of her heart, to serve her community. She doesn’t get paid a dime for her efforts! And no matter how long and busy Diane’s days are – every night, without fail, she’s there sharing the news of the community with the community. Diane was the perfect choice for this year’s award, which happened to be presented on International Women’s Day. And she was greeted with an enthusiastic and well-deserved standing ovation for her efforts! Local poet Jean Monce Bryant was even inspired to write a lovely tribute poem in Diane’s honor! Later that day, Diane was, of course, right back at it publishing the next edition of the Shoreline Area News. And by 10 a.m. that day, we had the Commons right back to business as usual as the community gathering spot and default heart of the community. But the work continues every day on both fronts! And it’s your support that makes this all possible, so THANK YOU! Thank you for your support and for being a part of our vital Commons Community! 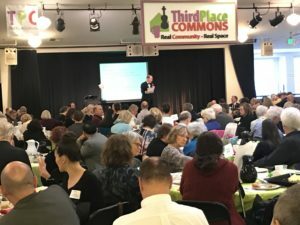 You can still support the essential work of Third Place Commons! Previous Post: Special Words for a Special Lady - Diane Hettrick!